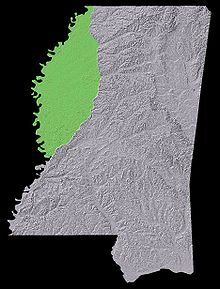 The Mississippi Delta, also known as the Yazoo-Mississippi Delta, is the distinctive northwest section of the U.S. state of Mississippi (and portions of Arkansas and Louisiana) which lies between the Mississippi and Yazoo Rivers. The region has been called "The Most Southern Place on Earth"  ("Southern" in the sense of "characteristic of its region, the American South"), because of its unique racial, cultural, and economic history. It is 200 miles (320 km) long and 87 miles (140 km) across at its widest point, encompassing about 4,415,000 acres (17,870 km2), or, almost 7,000 square miles of alluvial floodplain. Originally covered in hardwood forest across the bottomlands, it was developed as one of the richest cotton-growing areas in the nation before the American Civil War (1861–1865). The region attracted many speculators who developed land along the riverfronts for cotton plantations; they became wealthy planters dependent on the labor of black slaves, who comprised the vast majority of the population in these counties well before the Civil War, often twice the number of whites. As the riverfront areas were developed first and railroads were slow to be constructed, most of the bottomlands in the Delta were undeveloped, even after the Civil War. Both black and white migrants flowed into Mississippi, using their labor to clear land and sell timber in order to buy land. By the end of the 19th century, black farmers made up two-thirds of the independent farmers in the Mississippi Delta. In 1890 the white-dominated state legislature passed a new state constitution effectively disenfranchising most blacks in the state. In the next three decades, most blacks lost their lands due to tight credit and political oppression. African Americans had to resort to sharecropping and tenant farming to survive. Their political exclusion was maintained by the whites until after the gains of the Civil Rights Movement in the 1960s. In the 21st century, about one-third of Mississippi's African-American population resides in the Delta, which has many black-majority state legislative districts. Much of the Delta is included in Mississippi's 2nd congressional district, represented by Democrat Bennie Thompson. In recent years,[ when?] due to the growth of the automobile industry in the South, many parts suppliers have opened facilities in the Delta (as well as on the Arkansas Delta side of the Mississippi River, another area of high poverty). The 1990s state legalization of casino gambling in Mississippi has boosted the Delta's economy, particularly in the areas of Tunica and Vicksburg. ^ a b Mikko, Saikku (October 29, 2017). "Bioregional Approach to Southern History: The Yazoo-Mississippi Delta". Southern Spaces. 2010. doi: 10.18737/M7QK5T. Archived from the original on October 15, 2017. Retrieved October 29, 2017. ^ a b " Location Archived 3 June 2012 at the Wayback Machine". Mississippi Valley State University. Retrieved on April 5, 2012. ^ " State Prisons Archived December 6, 2002, at the Wayback Machine". Mississippi Department of Corrections. Retrieved on January 14, 2011. ^ " MDOC QUICK REFERENCE Archived September 27, 2011, at the Wayback Machine". Mississippi Department of Corrections. Retrieved on May 21, 2010. ^ Buntin, John. " Down on Parchman Farm Archived February 27, 2015, at WebCite". Governing Magazine. July 27, 2010. Retrieved on August 13, 2010. Null, Elisabeth Higgins. " Fifty Years After Brown: The Fight for Equality in Mississippi’s Delta Schools Continues," Rural Roots. Rural School and Community Trust, Feb. 2004.